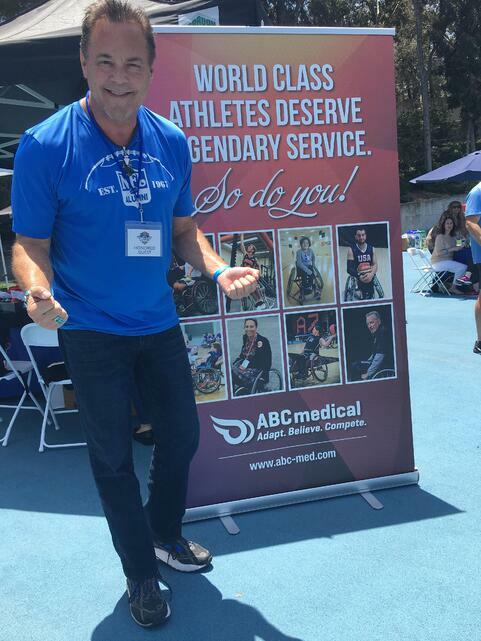 I came to Los Angeles, not only to represent my company, ABC Medical in providing medical supply services, but also to identify adaptive athletes to add more legendary adaptive athlete names to the list above by 2028, when the city hosts the 2028 Olympic and Paralympic Games. After all, we are in this to make a lasting experience and to bring this city to the next level. 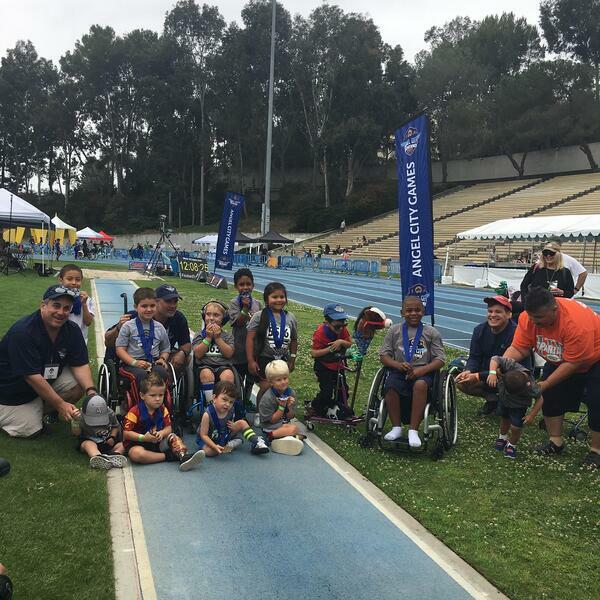 For the first time, ABC Medical had the opportunity to sponsor Angel City Games, a 4-day Paralympic sports clinics and competitions hosted at UCLA. The three people behind the scenes, Clayton Frech, Howard Brodwin and Michael Garafola that I got to meet in Phoenix, Arizona in 2017 Adaptive Sports National Conference had impressed me with their vision and passion for what they do. I could not think of a better opportunity to show our company's support for adaptive sports and compliment what they do with the unique services we provide to athletes. Joined by Ali, our marketing coordinator, a native of L.A. and an alum of University of Alabama, we set up our exhibitor table by the main stage in Drake Stadium next to Ottobock, an incredible prosthetics company and across from the social media giant Snapchat. In addition, our West Coast Sales Managers Lina Mozian and Matthew Torres joined us two days in a row to get a taste of adaptive sports and to witness the power of human ambition. Soon, they saw how sports contribute to what we do as a company and why our alliance with adaptive sports organizations makes perfect sense. 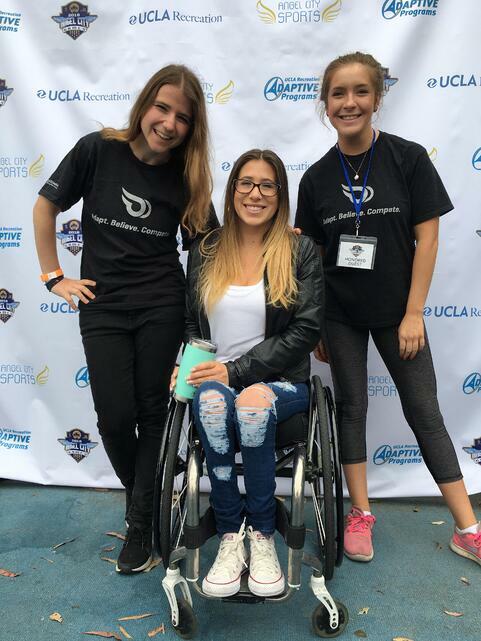 From track & field to wheelchair tennis, from swimming to wheelchair basketball, Angel City Games offered a variety of sporting events to individuals from all ages and ability levels. Of these events, the Toddler Games for young kids with various physical disabilities certainly proved to crowd favorite. Clinics were also offered as a learning platform to those who wanted to try a new sport or improve their technique. Mallory Weggemann, a Paralympian Gold Medalist, said, "I came here and within 2 days I tried 3 different sports that I had never tried before. It's amazing." Karen Keehn, 1976 Montreal Summer Olympic Games U.S Rowing Team member; Nick Lowery, a 7-time All-Pro placekicker for NE Patriots, KC Chiefs, and NY Jets; Kaitlyn Verfuerth, 3-time paralympian wheelchair tennis athlete; Rudy Garcia-Tolson, 4-time Paralympian Swimmer and Gold Medalist; Mallory Weggemann, Parlaympian Gold Medalist in swimming and an ESPY Award Winner; Megan Blunk, Paralympian Gold Medalist wheelchair basketball athlete; Matt Scott, 4-time Paralympian gold medalist and professional wheelchair basketball athlete, who's currently playing in Germany. This is just a small percentage of athletes who were present throughout Angel City Games. 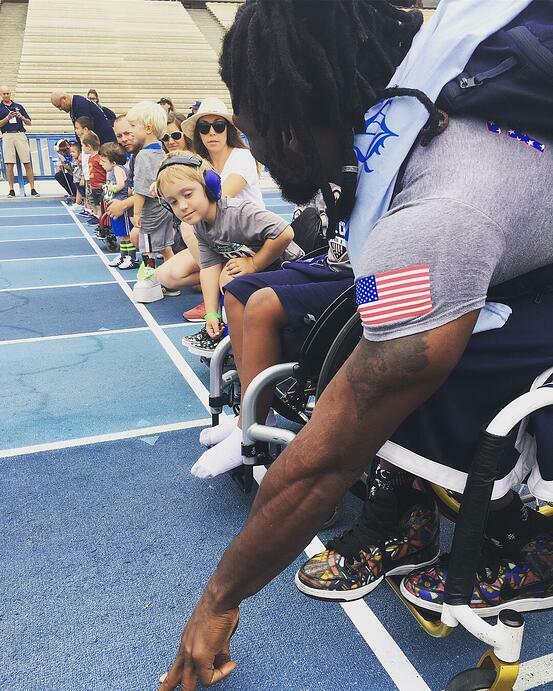 Nick Lowery: "This is the purest display of love," as he was cheering for track & field athletes by our booth. 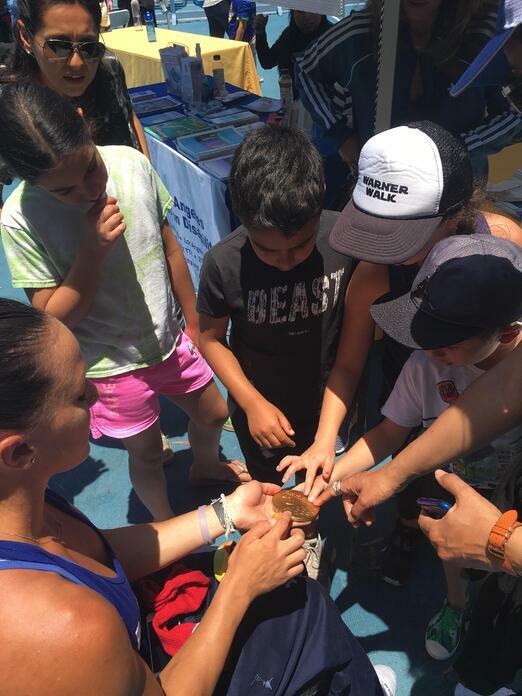 Paralympian Megan Blunk shows her Gold Medal from Rio 2016 games to the kids and lets them feel the medal. "The Gold Medal is engineered in a way so that visually and hearing impaired individuals can feel it as well" she explained. All Olympians and Paralympians were recognized on the stage. Just imagine, a young kid with or without a disability meeting some of these incredible legendary athletes. Imagine the kind of energy she or he could feel by being in that same environment breathing the same air as those athletes. That energy was definitely present in Angel City Games and it could be felt by not just the kids, but also adults, including us, sponsors. Matt Scott spotted in Toddler Games at the Start Line. Angel City Games did a great job publicizing the event in the media and bringing attention to it in the community. Our team was asked to join the iHeart Radio crew for the "fake or real news" show. While It was a lot of fun meeting the hosts, I appreciated the opportunity to talk about who we are and why were were at Angel City Games as a team. Just don't ask me how I did in the game itself haha! 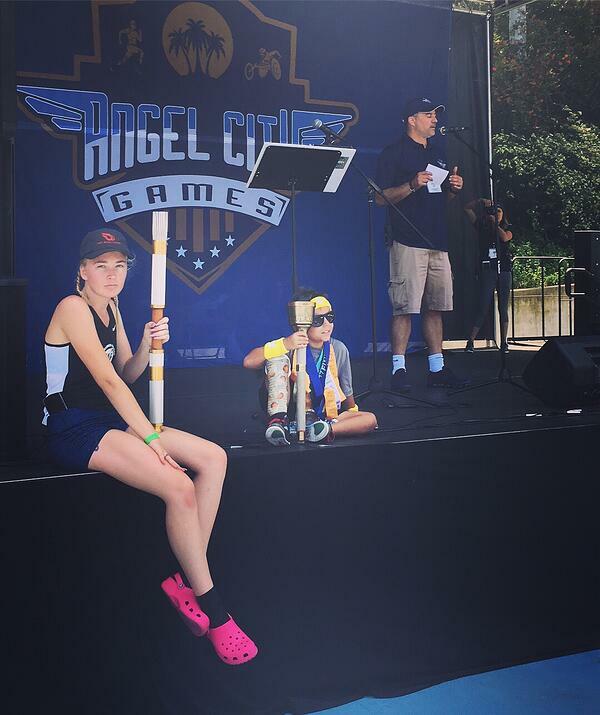 My teammates Ali and Matt were interviewed by the Angel City Games media team for a post-event recap video. Saturday night we were so excited and honored to watch the Angel City Celebrity basketball game and see the Mayor of Los Angeles, Eric Garcetti, actors Rob Schneider, Sheldon Bailey, and Donavan W. Carter play a friendly game of basketball. 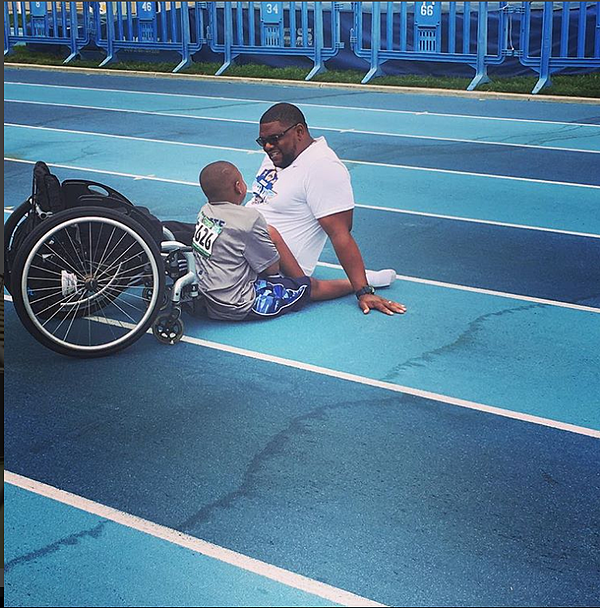 What a great way to introduce adaptive sports to the world. The power of media and PR cannot be underestimated in the growing game. Watch the episode on the Schmo here. It was nice running into our most recent scholarship recipients, Andrew Lee and Jose Estrada who're the forerunners on collegiate wheelchair tennis and future Team USA athletes. Watch these kids! They were competing along with some big names, such as Joe Chambers, who was last spotted in DK3 Dallas and Tony Lara, one of the veterans of the wheelchair tennis sport. They both won in their respective championship games. Congrats Andrew and Jose! Since we were in town, we wanted to connect with some friends and organizations that we've worked with in the past and meet in person. 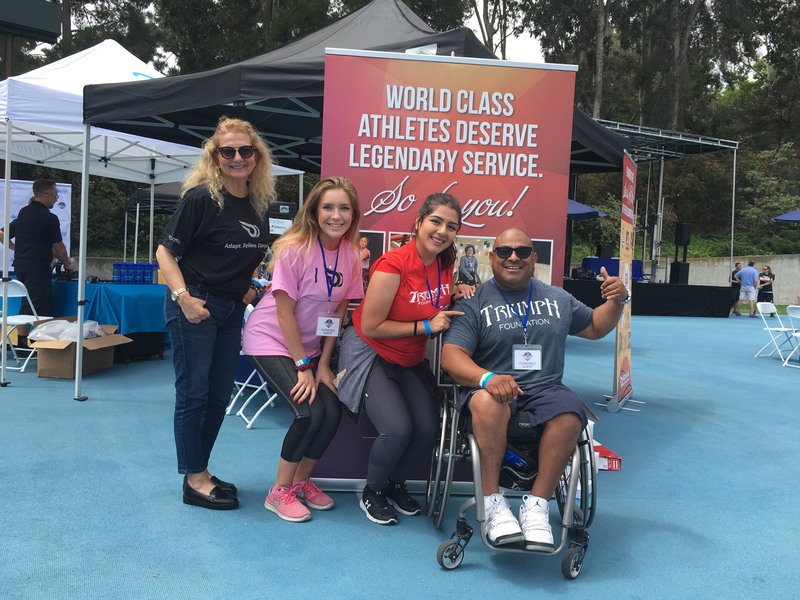 A big shout out to Triumph Foundation and its founder and ambassadors for doing the work they're doing to provide personalized care and comfort to individuals with spinal cord injury. We are fortunate to partner with them to support their efforts. It was great meeting the visionary leader and founder Andrew Skinner, and his ambassadors, Walter and Danny. If you haven't heard of Triumph Foundation, I encourage you to check out their website and find out about their events and programs and show your support. Another group who came to meet up with us is the founder of the Rollettes Dance Team, Chelsie Hill and the team's manager Joe. Chelsie is a well- known wheelchair dancer and an inspiration to many other young women who have a disability. Since she started the Rollettes along with 5 other young women, they've grown their programs and social media presence significantly and have become active in their communities. Their social media campaign "be boundless" is made to encourage people to have no limits and have a fearless and "boundless" life through dance. We were a proud sponsor of their ICU World Para Hip Hop dance competition in Orlando, FL this year and we're sponsoring the Be Boundless Summit on August 18th. More on the Rollettes will follow! 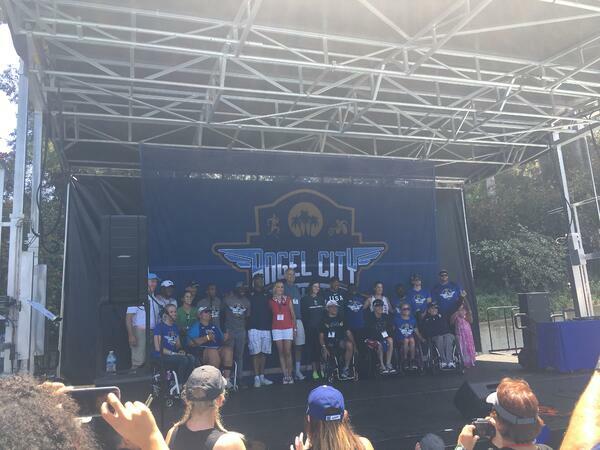 We'd like to say a BIG thank you to Angel City Games staff and volunteers for hosting such a great event and reminding everyone of their responsibility to grow adaptive sports and become an ambassador for it. Needless to say, at ABC Medical, myself and the entire team, embrace that responsibility of being ambassadors and ready to do what it takes to grow adaptive sports across the globe. « You don’t always win in sports, son. That’s what makes you an athlete. » tells a father to his son who just competed in the Toddler Games. 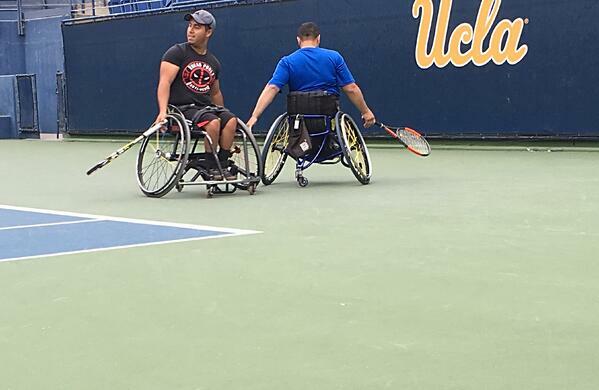 Los Angeles is lucky to have Angel City Games as the leading adaptive sports event in the area at UCLA. Meanwhile, California's first collegiate adaptive sports program will soon be established in San Diego at SDSU. These programs along with other smaller organizations are important to keep the momentum going and create a talent pool for Team USA and for the Paralympic Games, and really to provide opportunities for people to stay competitive and active. 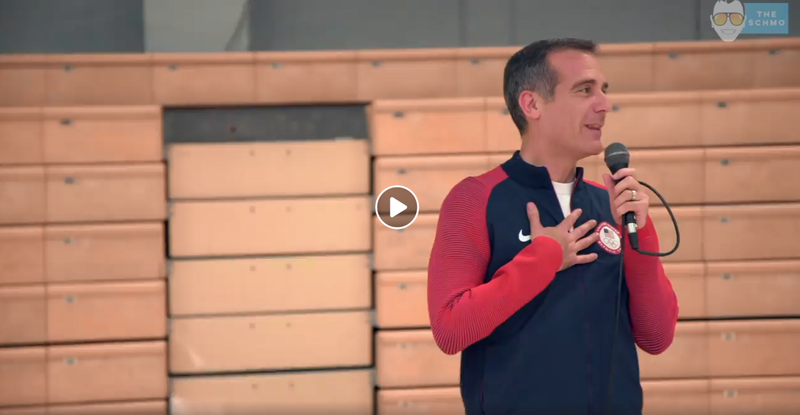 I could not be more hopeful that L.A. 2028 will be like no other in the history of the Paralympic Games, because as Nick Lowery eloquently put it, "adaptive sports is the purest form of love." I can't wait to see what the future holds. Thank you for reading.